Not gonna lie, I'm not too experienced with this style, but I thought the label art was so cool and kinda fu**ed up. Not familiar with Belgian Strong Dark Ales? Me neither, but a quick research easily shows notorious beers such as Chimay Blue and Trappist Rochefort 8 as some of the highest rated of the style. Those are some elite names, so it might be hard to follow in those footsteps, but let's give it a shot before we pass judgment. The pour is nearly pitch black. Only around the edges do I see hints of dark brown or mahogany. Picked up a finger of a frothy, beige head. Big plums and raisins on the aroma. It has characteristics of both sparkling champagne and red wine. Dark cherries and red grapes with Belgian yeast and hints of banana. Like I mentioned before, I don't have too many beers of the style to my name, but with this one I get some interesting flavors on the taste. The first thing I notice is a sour apple, or applesauce with hints of caramel and cinnamon. Dark fruits such as plums and raisins are next with a small helping of cherry. The finish has a lingering sourness. It's not a good, mout-puckering tartness like with most sour ales, but instead more of an off-Belgian yeast. Not repulsive, but it's not exactly blowing wind up my dress either. Mouthfeel is dry with a healthy dose of carbonation. There is somewhat of an alcohol taste. It's present, but not overpowering with a slight warmth on the finish. 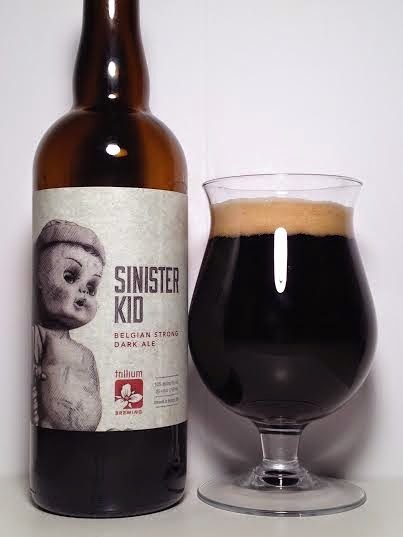 Sinister Kid is a heavy-hitting dark fruit bomb with tons of fizzy carbonation. The sourness can deter you from the true Belgian characters of the style, but there's just enough cherry, plum, and raisin flavors to hold you over and make this enjoyable.